At 3 : Prix Lupin (Gr.1 - 2 100m, Longchamp) beating CONTESTED BID and APPLE TREE, Prix de Suresnes (L.), Prix Ajax, 4th Prix du Jockey-Club (Gr.1 - to POLYTAIN). At 4 : Colonel F. W. Koesler Hdp (Gr.2 - Santa Anita) defeating MYRAKALU and THE TENDER TRACK, Fiddle Isle Hdp (L. - Hollywood Park), 3rd Arlington Million (Gr.1 - to STAR OF COZZENE), Citation Hdp (Gr.2 - to JEUNE HOMME), Inglewood Hdp (Gr.2 - to THE TENDER TRACK). At 5 : 2nd Breeders' Cup Mile at Churchill Downs (Gr.1 - to BARATHEA), 3rd in Eddie Read Hdp. at Del Mar (Gr.1 - to APPROACH THE BENCH), American Hdp., Hollywood Park (Gr.2 - to BLUES TRAVELLER), Inglewood Hdp., Hollywood Park (Gr.2 - to GOTHLAND), Colonel F. W. Koester Hdp., Santa Anita (Gr.2 - to BON POINT). 32 races, 6 wins, placed 12 times and 565 787 st. pounds. Winning distances at 3 and 4 : 8 f. - 10,5 f.
CUT QUARTZ, Prix Kergorlay (Gr.2 - Deauville - 15 f), Vicomtesse Vigier (Gr.2 - Longchamp - 15,5 f), Grand Prix Inter-régional des 3 Ans (L. - Toulouse - 11 f), Grand Prix de Bordeaux (L. - La Teste - 9,5 f), Prix La Moskowa (L. - Chantilly - 15 f), 2nd Prix du Cadran (Gr.1 - Longchamp - 20 f), Grand Prix des Provinces (Gr.3 - 10 f), Prix Gladiateur (Gr.3 - Longchamp - 15,5 f), Grand Prix du Sud-Ouest (L. - La Teste - 12 f), 3rd Prix du Cadran (Gr.1 - Longchamp - 20 f), Kergorlay (Gr.2 - Deauville - 15 f), Grand Prix des Provinces (Gr.3 - 9,5 f), Prix Exbury (Gr.3 - 10 f), Grand Prix Gaston Deferre (L. - Marseille-Vivaux - 10,5 f), Grand Prix de Marseille (L. - Marseille-Borély - 10 f). Sire. - HERNANDO (90 c. by Niniski). 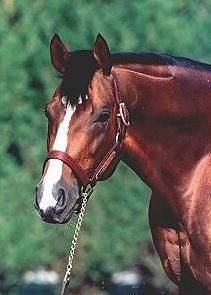 Jt Top Rated older horse in France and in Europe in 1994 (11 - 13,5 f.). 7 wins in France and 668 940 st. pounds. Prix du Jockey-Club (Gr.1), Prix Lupin (Gr.1), Prix Niel (Gr.2), Prix Gontaut-Biron (Gr.3 - twice), Prix de Suresnes (L.), 2nd in Irish Derby (Gr.1), Prix de l'Arc de Triomphe (Gr.1), Turf Classic Invitational Handicap (Gr.1 - Belmont Park), 3rd in Japan Cup (Gr.1). Sire. - WALTER WILLY (Ire) (91 c. by Sadler's Wells). Won 4 races in France and 62 532 st. pounds. Prix Michel Houyvet (L.), Grand Prix de Compiègne (L.), 3rd in Louisiana Downs Handicap (Gr.3). Sire in USA. - VINGT ET UNE (Sadler's Wells), 1 win. Dam of a winner. - ELEOS (Exit To Nowhere), 3 wins and 235 000 FF. Sire in France. - ADNAAN, 3 wins, Zetland Stakes (L.), 3rd Gordon Stakes (Gr.3), Sport On 5 March Stakes (L.). Sire in France. - BRICASSAR (c. Irish River), 2 wins in France and 366 400 FF. Prix Daphnis (Gr.3), placed 3 times inc. 3rd Prix La Force (Gr.3), 4th Prix de Guiche (Gr.3). Sire in France. - CLAUDIUS. 9 wins in the USA and $ 351 457. Lamplighter Hdp. (Gr.3 - Monmouth Park), Hopemount Stakes (L. - Keeneland), 2nd Jersey Derby (Gr.2 - Garden State), 3rd Generous Stakes (Gr.3 - Hollywood Park), Tropical Park Derby (Gr.3), Bougainvillea Hdp. (Gr.3). Sire in the USA. - VINISTA (USA), 9 wins in the USA and $ 381 118. Bryan Station Stakes, Keeneland (L.), placed 2nd in Dahlia Handicap, Hollywood Park (Gr.2), 3rd in San Gorgonio Hdp., Santa Anita (Gr.2), Honeymoon Hdp., Hollywood Park (Gr.3), Linda Vista Hdp., Santa Anita (Gr.3). - LAST GLANCE, 2 wins. Dam of MINGLING GLANCES, 6 wins, Mint Julep Hdp (L.), Valley View St. (L.), Bryan Station St. (L.), 2nd Cardinal Hdp. (Gr.3 - twice), Jenny Wiley St. (Gr.3), 3rd Gallinule St. (Gr.2), Locust Grove Hdp. (Gr.3). Broodmare. - INTERCOMPANY, 1 win. Grandam of EFFECTIVENESS, 5 wins, Powder Break Hdp. (L.), Columbiana Hdp. (L.), 3rd Delaware Hdp. (Gr.3) and $ 504 971. - Little Look (USA), 2 wins at 3. Also 3 races in USA and $ 105 150 including Q, Del Mar, 3rd in John Henry Hdp, Hollywood (Gr.1), Pennsylvania Governor's Cup, Penn National (Gr.3), Daryl's Joy Stakes, Saratoga and 4th in Manhattan Hdp., Belmont (Gr.1). Sire in USA. - PALACE MUSIC. Champion Stakes (Gr.1) at 3, John Henry Hdp., Hollywood Park (Gr.1), Bay Meadows Hdp. (Gr.2), La Coupe de Maisons-Laffitte (Gr.3), Prix Daphnis (Gr.3). Placed 2nd in Prix Jacques Le Marois (Gr.1), Breeders' Cup Mile, Santa Anita (Gr.1), 3rd in Dubaï Champion Stakes , 4 th Benson and Hedges Gold Cup (Gr.1). Sire.